It's been a good run lately for A.C. Newman and his cohorts. His supergroup the New Pornographers' last release, Electric Version, contained some great rock 'n' roll moments, largely due to Newman's songwriting. Other Pornographers (Dan Bejar with the Destroyers, and Neko Case) have had success with their less collaborative endeavors, so it's probably time that Newman got his own record out. With The Slow Wonder, he's set the standard for his group's solo projects. In "The Battle for Straight Time", Newman sings, "The revolution has been left to chance." The sentiment is intriguing, largely because it's one of the most incongruous lines on the album. 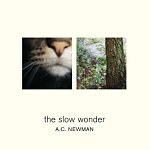 Newman's writing leaves nothing to chance; each track finds its structure built around catchy hooks and memorable choruses, and with its longest song clocking in around four minutes, The Slow Wonder carries no excessive notes. That said, Newman's not intending this disc to be a revolution. His songs fit perfectly in the guitar-pop tradition. You indie kids won't find any experiments here, but you will find some great tunes. Newman doesn't rely on allusive performance or a retro-sound or the latest craze. He just does his straightforward rockin' thing, and it works well. The album opens the steady drumming and memorable riff of "Miracle Drug". The track manages to sound like everything you've heard on the radio in the last 25 years, and yet completely its own. There's some tasteful synth work and a classic-rock guitar solo. It cuts off quickly, and the slower, largely acoustic work of "Drink to Me, Babe, Then" starts up. Newman's shifted gears so smoothly that his passengers haven't noticed that he's on different terrain. With the possible exception of "Miracle Drug", "Secretarial" stands as the catchiest song on the album. It's got a '60s vibe, but it never feels like a retread, and maybe that's why Newman's insisting that you "can't take the map". It's not quite clear or important what he's getting with his lyrics; "Secretarial" is car-windows-down song, and you can make a note of it. While it's delivered splendidly, The Slow Wonder doesn't succeed as well as an album as its songs do as individual parts. A full listen gives you plenty of enjoyable moments, and it will just about guarantee you a song to keep stuck in your head. However, Newman doesn't deliver a great statement. His album lacks an over-arching theme, and it doesn't quite come off as a mood piece. The Slow Wonder is the type of album that I suspect will get many spins without anyone thinking of it as a desert-island disc. Of course, criticizing an album my saying it's not an emotional must-have is like criticizing a party for not being a lovers' walk on the beach. Sometimes you need company to just get crazy with, and any big moments you get through the shouted conversations are just a bonus. Newman's just the DJ at your party, and he doesn't often let on that he knows the way to the shore. Enjoy yourself knowing if you can't drive home, at least there's a spot on the floor for you.